Laura and Bill at the piano in the Delta Queen's Orleans Room. Well, it’s official. 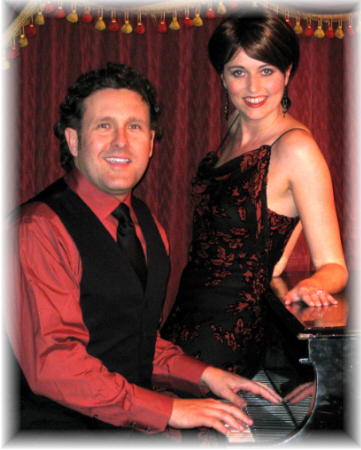 Laura and I will be headed back to the Delta Queen to perform for a limited engagement from November 25 through December 18. So make your plans now to come to Chattanooga to visit us and the Delta Queen. Give yourself a gift this holiday season! Make your reservations soon at www.deltaqueenhotel.com. We will be performing in the Texas Lounge and for some holiday parties in the Orleans Room. We’ve taken the Holiday Show we wrote for the Mississippi Queen a few years ago and customized it with a special Delta Queen flair. I’ll keep you posted with more details soon. We are so excited to be going back to the Delta Queen. Even though in the last year we have toured across the U.S., Canada, and the United Kingdom, the Delta Queen remains so special in our hearts and we love performing there. 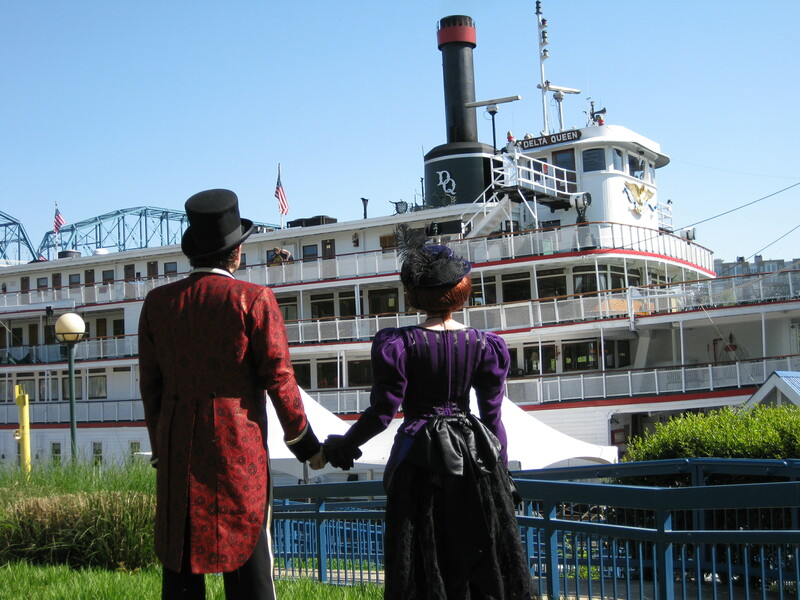 Our love affair with the river, riverboats, and the Delta Queen runs very deep. 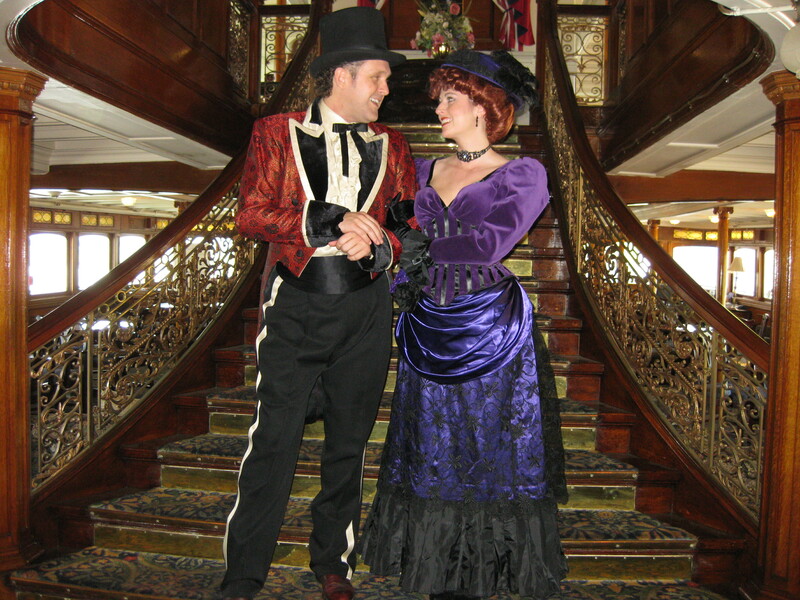 After working on the riverboats for a decade, we were honored to be asked to appear as special headline entertainers for the Delta Queen’s 2008 farewell cruising season and to write a special musical show about the boat’s fascinating history. That labor of love also yielded an audio CD entitled Delta Queen: A Musical Journey which we are very proud to have recorded. You can hear track samples of that CD by clicking here. Bill also recorded an audio history of the boat entitled The Life and Times of the Steamboat Delta Queen which recounts the fascinating adventures of the boat’s dramatic career. We also coordinated a series of celebration events for every 2008 port of call to join with those cities to celebrate the Delta Queen’s career and her long history docking in those ports. Wonderful crowds gathered along the river to pay their respects. We did dozens and dozens of print, radio, and television interviews. I even shared the boat’s story on National Public Radio, CNN, and ABC television’s “Good Morning, America.” It was an amazing year. After the last cruise ended in Memphis, we rode her down to New Orleans for their tribute event and then helped to prepare her for lay-up and an uncertain future. It was an incredible experience sharing the magic of river travel with the wonderful Delta Queen passengers, working with the incredible Delta Queen crew and talented entertainers. We all became a special kind of family living aboard together. Despite the heartache and sadness of that last cruising season, I wouldn’t trade it for anything. I was thrilled to hear that instead of rotting and being forgotten that the boat had been leased to serve as a hotel in Chattanooga. At least she would be cared for and open to the public. And there are few prettier places than the Tennessee River as it loops through the beautiful bluffs of downtown Chattanooga’s lovely waterfront. I was honored be invited to accompany the Delta Queen on her final voyage as she was relocated from New Orleans to Chattanooga. It was an incredibly special and emotional experience to realize I was a part of likely the last overnight steamboat trip in American history. Videographer extraordinaire Eric Hadley (a former riverboat entertainer and cruise director turned incredible filmmaker) and I were contracted to produce a documentary film chronicling this historic journey and highlighting the history of this amazing vessel. Fellow Delta Queen historian Karen “Toots” Maloy joined us in recounting the tales of the boat’s history as we shot dozens of hours of incredible footage which Eric and I ultimately edited down into a one-hour film. It’s one of the creative projects in my life of which I am most proud. With an array of more pressing startup expenses to focus on, almost a year and a half later, Delta Queen Hotel (which owns the rights to the finished film) has yet to produce the DVD and make it available to the public. Someday! Laura and I then were contracted by Delta Queen Hotel’s previous operator Sydney Slome to develop and provide entertainment programming for the boat’s first summer season open as the Delta Queen Hotel docked in Chattanooga. We had a wonderful four months in Chattanooga. Performing on the Delta Queen is a real thrill. Oh, to play and sing up in the Texas Lounge with that history all around you and the beautiful view of the river. Or to do our mainstage shows on that cozy wonderful stage down in that magical Orleans Room, where so much happiness has occurred, it just permeates the room! Or to do my Riverboat Gambler card magic act onboard the last operating overnight steamboat in U.S. history — it just doesn’t get much cooler than that! 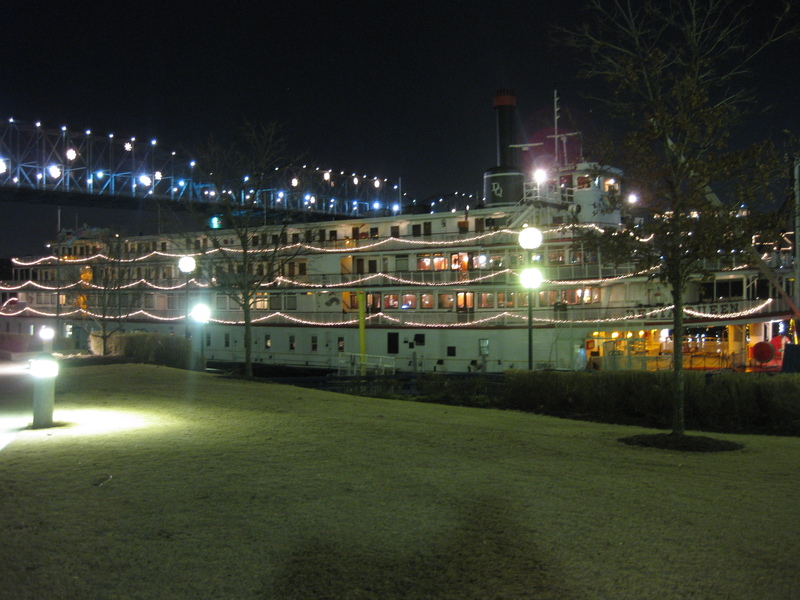 And so, as you can see, our relationship with this grand old lady – the Delta Queen – is deep and rich. We love the boat, its history, its alumni crew, and its previous guests. We hope to share a bit of all of that again with you soon on the Delta Queen this holiday season. Please come and join us! We’ll see you in Chattanooga! Leah Ann and Randy Ingram have purchased the charter rights for the Delta Queen Hotel. I know Leah Ann from her more than a decade as a motorcoach vendor and tour operator for the Delta Queen Steamboat Company. She knows the boat and the importance of its historical significance. She’s also a dynamo with more energy than any one person should have and her love and enthusiasm for the Delta Queen is immense. She’s a great marketer and manager and will be a terrific overseer of the Delta Queen. Leah Ann and Randy Ingram, founders of All Aboard Travel have purchased the charter rights of the Historic Delta Queen from Sydney Slome and have assumed full responsibilities and operational control of the Delta Queen hotel. The transfer was financed by Gateway Bank and Trust at a non-disclosed price. Mr. and Ms. Ingram have over 40 plus years combined experience in the hospitality industry. Their five year plan for this boutique hotel is to increase occupancy, ADR and overall revenue from all outlets on the Delta Queen Hotel. The management team has designed a marketing plan that is aimed at repositioning the boutique hotel into the top ranks in the Chattanooga area. “This historic landmark is well-known worldwide, and by her name alone, will attract a wide range of visitors to Tennessee and the Chattanooga region,” said Ms. Ingram. The current management has created a marketing plan which will target increasing occupancy to 60–65 percent. The average daily rate needs to remain competitive in the local market but also needs to reflect specific benefits, such as complimentary breakfast and valet parking, it was stated. Ms. Ingram is a travel industry expert and the owner of All Aboard USA, a group tour and motor coach transportation company based in Chattanooga. The company offers customized tours throughout the United States catering to a broad range of markets, specializing in educational and senior travel planning. The company’s fleet consists of 56 passenger fully equipped luxury motor coaches, 28 and 14 passenger mini-buses for local shuttles. All Aboard was founded in 1996. The company began a relationship with the Delta Queen immediately, providing ground transportation coordination and city tours for passengers during stops at port. This relationship continued in this manner until the Delta Queen stopped sailing in 2008. Most recently, Ms. Ingram partnered with the Delta Queen Hotel as the exclusive agent for group arrangements. She is responsible for growing the hotel bookings significantly since the boutique hotel’s opening, and continues to work with the historic Delta Queen to improve efficiency and offer the best experience to group and leisure guests on board. Mr. Ingram has over 20 years of experience in the tour and travel industry. He is a former co-owner and founder of Premier Transportation in Knoxville. Premier was founded in 2003 and increased initial gross revenues from $720,000 in the first year to over $3,000,000 by the year 2008. He is currently a co-owner of All Aboard USA with his wife. All Aboard is a leader in the group travel industry and serves as the exclusive group sales agent for the Delta Queen Hotel. All Aboard also operates several motorcoaches. Randy and Leah Ann have numerous contacts throughout the United States in the tour and travel market. All Aboard is a member of the American Bus Association, United Motorcoach Association, and Tennessee Motorcoach Association, where Mr. Ingram is the current president of the association. Julie Dodson, sales and marketing director, received her bachelor of arts degree from the University of Tennessee at Knoxville, and began her career as a teacher of high school English. After eight years of teaching in the Knoxville and Nashville areas, she moved to Memphis and joined the forces of United Airlines as a ticket and gate agent. Needing to return to East Tennessee, she continued her work in the travel industry at a local travel agency. As an agent for five years and the manager for five years, she traveled extensively as a tour director for groups of 100 or more. Countries visited were Mexico, Switzerland, Italy, Germany, and others. The next career stop took Ms. Dodson to the Chattanooga Choo Choo, where she worked in sales for five years, them became its marketing director for 15 years. Her responsibilities included all media and public relations, packaging the hotel with attractions, all print collateral, trade agreements, in-kind services, and more. In November, 2009, Ms. Dodson joined the Delta Queen Hotel crew as the director of sales and marketing. She is also managing all marketing responsibilities at All Aboard USA and Reliable Transportation. Leah Ann and Randy Ingram have purchased the charter rights of the Historic Delta Queen and full operational control of the Delta Queen Hotel. They will be a positive and dynamic force for the Delta Queen as they are both travel industry experts and also own All Aboard USA, a group tour and motor coach transportation company based in Chattanooga. Leah Ann worked for years with the Delta Queen coordinating motorcoach transportation for airport transfers and shore tours in many ports of call. She is enthusiastic, delightful, and immensely energetic. She loves the Delta Queen dearly and will be a guiding light, protective guardian, and passionate advocate for the boat. The Ingrams are savvy businesspeople with a clear and detailed understanding of the boat’s potential as a hotel. They have many group contacts and excellent marketing skills. I will keep you posted as some of their exciting new plans develop. We were contracted to perform onboard for the summer of 2009 with previous operator Sydney Slome as the boat opened as a boutique hotel in Chattanooga. We certainly acknowledge his role in making sure the Delta Queen has been cared for and open to the public for all to enjoy her special history and the unique experience of dining, enjoying entertainment, and staying aboard overnight. Without the commitment of Mr. Slome, and now Leah Ann and Randy Ingram, the Delta Queen could easily have ended up tied off at some remote dock, rotting away lost and forgotten to the American public. Although we wish she could have cruised forever, she at least has a beautiful home in Chattanooga and is loved and open for us all to enjoy. Go visit the Delta Queen soon!